At FineCal we have produced a large range of Labels for our customers and manufacturers of Ice Cream. So we really know how important it is to have a high-quality and professional labels printed. Just as the weather begins to pick up and the days become longer it's time to ensure your Ice Cream labels are printed in high quality and really show off your brand. An eye-catching label can really sell the Ice Cream. At FineCal we generally use semi-gloss paper for Ice Cream Labels. We also use a freezer adhesive to ensure that the label remains perfect when frozen for all lengths of time. Self adhesive labels on Ice Cream containers can be repeatedly exposed to a variety of temperatures before and during storage which is why the adhesion levels of the labels must be high quality. Optimal temperature for normal adhesive on printed labels is close to room temperature. This is why we use a rubber based freezer adhesive for Ice Cream Labels that can perform from -50°C to +70°C. The temperature range is important for Ice Cream labels as they might be chilled or later frozen or even applied to already frozen Ice Cream tubs. 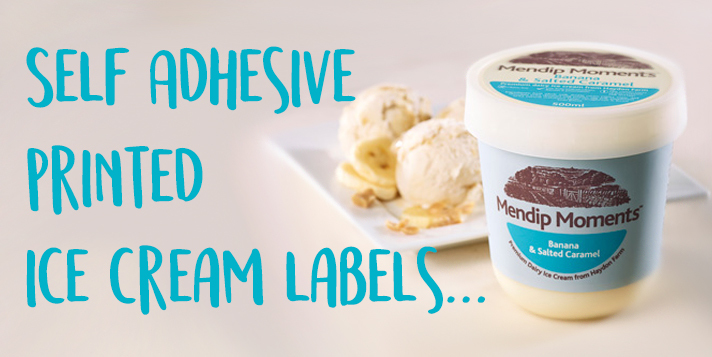 Either way our rubber based freezer self adhesive labels are essential for all Ice Cream tubs and containers.